The 5th season of the Clan League started on 4th January and the PS community was anticipating an exciting battle for the title. The two times champion Alexander The Great (ATG) was struggling in the CL Hall of Fame event before Christmas, where DiRtY SoUtH (DS) was victorious. Furthermore, their main rival for the title, Bharat Legends (BL), became champion of season #4, so both clans were tied on title wins before this season. The PS community was wondering: will the battle for 1st place in Division 1 become again a two horse race between ATG and BL or can DS or any other clan intervene? ATG and BL won their first 3 matches respectively, so both went with 9 points into the direct match on 18th January. In this predetermining battle for the championship, ATG showed their strength by beating BL with a clear score of 39 – 15. 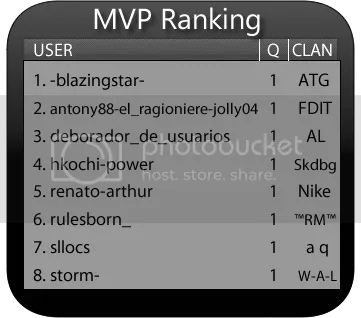 They proved especially that they have the deeper squad, because in this cup the “ordinary” MVPs -blazingstar- and edu_cadillac didn’t gain the most points for their clan. It was CA bennaidu who won the award for Most Valuable Player and leaded his clan to this important victory. DiRtY SoUtH couldn’t intervene in the title race again after losing very closely with 15 – 17 against BL already at the 2nd matchday. DS even became only 4th, because promoted team Chelsea -Fc – claimed the third place. They gained respectable 9 points by winning 2 matches on WO and beating the robines clan by a clear margin of 19 – 3. The fight against relegation was very close and exciting. Whilst †Tricolor Heroes †™ finished the season with 0 points on the last place of Division 1, three teams were tied on 6 points in the end. One of those clans was DS, the other ones were robines and promoted team Romanian Patriots. The cup points difference was now the decisive factor and there, robines turned out to be the team with the worst difference of these three. In Division 2, ™ Top Players™ became 1st due to having a better cup points difference than second placed clan Leave us Alone™ (LUA), although LUA beat them in the direct match with 20 – 13. However, LUA lost their first match this season against promoted team Legends Reborn. The relegated teams from Division 1, Fratelli Italiani (FDIT) and Misfits (MF), were no hard contenders for the promotion places in this division. FDIT already lost their second match against LUA and were even defeated by MF with 26 – 32. Due to this win, MF became 3rd in the final table with 12 points. The TVST clan managed to remain one more season in Division 2, beating SURREAL and Legends Reborn (LR) each on WO. The two promoted clans have to go back again into the 3rd division after only one season. 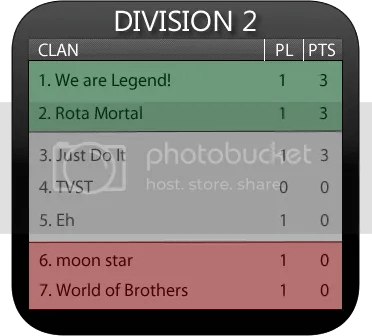 The dominating clan in Division 3 was moon star. They even managed to beat the second placed clan Guess Who (G-Who) with an amazing score of 51 – 6 and so they finished the season with the maximum of 18 points. G-Who grabbed the second promotion place, thanks to an 18 – 13 victory over their hardest contender The Dark Lords™. These two clans just entered the league this season, but already showed a strong performance. The other clans that played their very first season of the Clan League, TheWorldRulers (TWR), Dove℗ and SooGood, couldn’t avoid relegation. Whilst Dove and SooGood only played two of their matches and finished the season with 0 points, TWR could at least win once by beating Dove℗. However, they couldn’t leave MAHATMA GANDHI JI!!! behind them, who are placed 4th in the end with 9 points. There is one user, who left his mark on this season. Edu_cadillac achieved to win 2 MVP awards for ATG and even 3 for LUA with his second account resurrection. Therefore, I think we can consider him as the best player of this CL season. I hope you enjoyed reading this article and I hope you stay tuned to the Clan League, the only official clan competition in Power Soccer. Hello guys, this is washeka bringing you a report of the match of this week from Clan League! We have all been waiting so long for this match! The battle of the two PS titans, ATG and Skenderbeg, also the former/current dominant rank 1 clans. It was indeed a nail biting cup this Sunday, as the 2 clans clashed and battled it out, we knew that this could most likely decide the winner of Division 1, yes…everything rested on this match up. So without further blabbering, let’s get on and see what actually happened! Hey guys, welcome to the beginning of a series of articles which, as you may be able to see by the title, will be focusing on the all-new ‘Clan League’. Each week, PSE will be delivering you news of teams, scores and standings, so be sure to visit here every week for more info! Below, there is an FAQ to what the clan league is all about. If you think you know all this information, read on and see if there’s anything new to you. This FAQ is only exclusive for this first article of the series, the next few won’t contain these. The Clan League is a new league system for clans presented by Crew some weeks ago. It consists of three divisions with seven clans in each and has got a promotion and relegation system. Even though this season will last seven weeks, usually its duration will be of four weeks and the last week of every month will be taken as an off-season, in where clans will be able to rest and prepare themselves for the next one. To find out more go to the Clan League Page. What clans can participate in it? There was a registration period and this will be held again before each new season. The top 21 ranked clans were chosen who qualified and registered for this league tournament. If you want to register your clan you will have to wait for the next season and register then as the first season is already underway. How do we play against other clans in the league? Through cups,they are always between two clans. The ideal quantity of players for each one is five, although the number can increase if users want to or decrease to 2v2 . If you show up with less than five players, there will be some consequences, you will lose 2 cup points from overall score for every missing member. When do we play these cups? It is best to play your cups at the scheduled time, though you can play them before the scheduled time, any day on that specific game week, as long as you call a game host to the cup and both clans agree. Who are responsible for making this Clan League? 1st division GHs: eefjo (Holland), washeka (England), landa02 (Argentina). 2nd division GHs: marci-fcm (Germany), nev72 (Wales), bennaidu (Malaysia). 3rd division GHs: camiventa (Uruguay), norwegian (Norway), skylimit-is-back (Romania). You can also learn more and know more about the rules in the Clan league rules thread made by Pow here. Get the latest Clan League news! So let’s recap on what happened last week in the league! La Selecc10n Argentina 20 – 11 ! Polish Team ! PL = Played Matches; PTS = points. As only one gameweek has been played, we can find in the three divisions three clans tied in first place, and three in the last one. The most notable fact is Alexander the Great‘s overwhelming victory against powerful Chelsea-Fc in the the competition’s first cup. Also it is necessary to emphasize ẴLIAЛZA ► ▼ ◄ ╬ ╬ ™ LAŤIЛA ‘s great victory. At the beginning they had lost the first two matches but later were able to give their best and accomplish a final score of 63-9. Beyond that, nowadays there is not much to say as there is not a clear leader yet, not even in one division – We just have to wait and find out which clan can hold it till the end. Q = quantity (of MVPs). So, it looks like the league is going well so far, each division is quite tight at the top and bottom, so we will have to wait and see what next week has in store for us! A question to finish off, who do you think will win the most MVPs? and what are your predictions for each division? Let us know in the thread in GD forums! The English Premier league returned this weekend after 2 months away. Last season saw Manchester United take the Premier League title, Manchester City splashing the cash and a relegation battle that went down to the wire but will we be in for another season of excitement? This time around, there are 3 new teams in the league (QPR,Norwich City and Swansea City). QPR went up as runaway champions of the Championship and Norwich came in 2nd following a late season slump by my club,Cardiff City.Swansea City went up after a Scott Sinclair hat trick in the Play-off final at Wembley against Reading. So how will these 3 teams cope with life in the premiership? In my opinion, not well. Swansea have lost goalkeeper Dorans de Vires to Wolverhampton and Franco Borini who’s loan spell has now ended. They have been replaced by Jose Moreira from Benfica and record signing and last year’s top championship goal scorer, Danny Graham from Watford. The rest of the squad lack Premier League experience and on paper, they should come in 20th place and come straight back down. Norwich have earned 2 promotions in 2 years but surely survival would be a great achievement but it doesn’t look like they have the ability to stay up. They have brought in Ritchie de Laet on loan from Manchester United and Wales international striker, Steve Morison. Like Swansea, most of the Norwich squad have never played in the Premier League before. They look like they will fall just short of survival with 17th place being where many predict they’ll come. On paper, QPR look the most likely to stay up. After running away with the championship last season under Neil Warnock, they were never far from newspaper headlines with allegations they broke the rules over the signing of Alejandro Faurllin in 2009. Media speculated that QPR would be docked points to prevent them going up automatically but they were only found guilty of 2 of the 8 allegations and were find £825,000 rather than docked points. QPR have Moroccan international and Championship player of the year Adel Taarabt in their squad but their survival depends on if he stays with them. QPR have signed former Cardiff striker Jay Bothroyd on a free transfer and Danny Gabbidon and Kieron Dyer from West Ham, again on a free. They could scrape past the drop but It’ll be close between them and Norwich in my opinion. QPR should just about survive but it could go to a final day relegation scrap. Blackburn Rovers look like they’re in really big danger. After escaping the drop on the final day of this season, it looks like it’ll get a whole lot worse for Blackburn. To survive, they have to keep hold of their big 2 players, Paul Robinson and Chris Samba. If they lose even one of them, their fate looks steeled and their fate looks to be relegation. A lowly 19th is where I think they’ll come. Let’s look further up the table, Aston Villa have brought in a new manager in the form of former Birmingham City manager Alex McLeish. McLeish lead fierce city rivals Birmingham to relegation last season. McLeish controversially took charge of Villa in June and he has since brought in Manchester City’s Shay Given and Wigan’s Charles N’Zogbia. Following a poor season last season after losing Martin O’Neil days before the start of last season and Gérard Houllier to illness towards the end of last season. A 9th place finish should do them justice, possibly sneaking 8th. Sunderland had a solid season and manager Steve Bruce has raided his former club Manchester United for Wes Brown and John O’Shea who join former United players Kieran Richardson and Phil Bardsely at the club. An even better season could be in store for Sunderland despite loosing Darren Bent in January. Stoke City and Everton should also be in the top half of the table. Following Stoke’s trek to the FA cup final, they will be brimming with confidence despite their lackluster 13th place finish. Stoke’s WELSH manager Tony Pulis (Yes, I did capitalize and make the word Welsh bold) has added a few injury prone but top quality players to their squad. Jonathan Woodgate and Matthew Upson have been signed after being released by Tottenham and West Ham respectively. Everton have been very consistent over the last few seasons but they have slowly slipped down the table following the emergence of Manchester City and Tottenham. The issue with Everton is that they don’t make any big signings to compete with the likes of Tottenham. Out of Aston Villa,Sunderland, Stoke and Everton, they will probably finish bottom of the 4 following no major signings. Scottish manager David Moyes needs to bring in a few players before time runs out. Things are going to get interesting at the top end of the table with dominant United, cash splashing City, stylish Tottenham, selling boys Arsenal, the young boys of Liverpool and Manager switching Chelsea all fighting for the title. We start our look at the big 6 with Liverpool. Liverpool legend Kenny Dalglish is now the full time manager after being appointed Caretaker manager last season following Roy Hodgson’s shocking 1st half of the season ended in him resigning in January. New American owner John W. Henry has given Dalglish an awful lot of money to spend following the sale of Fernando Torres to Chelsea. They have signed Charlie Adam from Blackpool, Jordan Henderson from Sunderland, Stewart Downing from Aston Villa and José Enrique from Newcastle. Liverpool had a shocking season by their standards last season but this season should be better. It’s going to be tight as to whether they make it back into the top 4 again but without the distraction of European Football, they could have a slight advantage. Next up is Tottenham who had a great season last year despite dropping out of the top 4. WELSHMAN Gareth Bale (Yes, I did it again) was the talk of football following stunning performances against Stoke in the EPL and Inter Milan in the group stages of the Champions League. Harry Redknapp has done very well to keep him but they will probably miss out on the top 4 should they lose him in January or in the last 2 weeks of the summer transfer window. Rafael Van Der Vaart was a key player for Spurs last year and so was Luka Modric. Keeping them will also be key to success this season. However, a lack of new signings could be their downfall with the only major signing being American goalkeeper Brad Friedel for free from Aston Villa but it could be a vital signing after Heurelho Gomes had a few dodgy moments last season. Arsenal look as if they’re in major trouble after selling captain Cesc Fábregas to his home club FC Barcelona for £35 million and Samir Nasri and Emanuel Eboue’s departures look imminent. Gael Clichy has also left for Manchester City for a bargain price of £7 million. They have brought in Gervinho from French side Lille for £10.5 million and youngster Alex Oxlade-Chamberlain from Southampton for £12 million but can he follow in the footsteps of Theo Walcott who also joined Arsenal from Southampton a few years a go? My personal opinion, no but maybe in a few seasons time. It will be a year for the younger players such as WELSHMAN Aaron Ramsey (and I did it again) and Englishman Jack Wilshere to step up to the mark but unless Arséne Wenger brings in a lot of new faces in the remaining 2 weeks of the transfer window, I can’t see them remaining in the top 4, possibly losing out to Liverpool or arch rivals Tottenham. We’re down to the big 3 who should be the main contenders for the title. I am of course talking about Manchester United,Manchester CityandChelsea. By Chelsea’s standards, it’s been a quiet pre-season apart from the introduction of the youngest manager in the EPL, André Villas-Boas. With no real transfers to talk about, they’ll probably come 3rd this season but if El £50 Million Pound man (AKA El Nino, AKA Fernando Torres) starts putting the ball in the net, they could push for 2nd but they also need a few more world class players. Manchester City have been the club splashing the cash with the most expensive transfer thus far in the transfer window, Sergio Aguero’s £38 million move from Athletico Madrid. Their success this season depends on how well he settles into the English game. Also moving to the newly named Ethiad Stadium is Gael Clichy and Stefan Savic. It will be no surprise to see more world superstars moving to the blue side of Manchester soon but I can’t see them catching their big rivals Manchester United this season but I can see them winning the FA Cup again. And that brings us onto the most successful club in England, Manchester United. With 19 league titles under their belt, they should go onto win their 20th title this season. Sir Alex has made 3 major signings: Phil Jones (Blackburn), David De Gea (Athletico Madrid) and Ashley Young (Aston Villa) and they have retained most of their 1st choice team. The fact Manchester City’s new squad are still gelling together and Chelsea rare lack of signings could mean United should win the title. And that concludes this look at the new Barclays Premier league. I’m sure you’re looking forward to finding out what happens along the long road to May.